On July 4, 2017 at 11:35:33 pm edt, when the Sun returns to its position (13Can19) on July 4, 1776 (using 5:09 pm LMT Philadelphia, PA; 2017 chart set for Washington DC) as it does annually on or about July 4th (Independence Day), nebulous Neptune @14Pisces Rx will rise and serious Saturn Rx @23Sag will culminate at Midheaven (MC), the Public Status point of the horoscope. The recent Saturn-Neptune square will have waned but the trappings of this societal pairing remains as austere forces continue their long dreamed of attempt to undo FDR's New Deal programs and demolish LBJ's Great Society agenda. Now it's a mystery how far along the current Trump-Russia investigation will be by July 4th but we can find a major part of it on the US Solar Return 2017 horoscope. 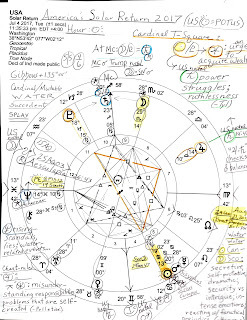 Mr. Trump's natal Moon-South Node conjunction is there at MC for all to see along with restrictive Saturn while his natal Sun-North Node conjunction (electrified by his oriental Uranus in Gemini and making a formidable trio) conjoins the IC of this Solar Return chart--along with US natal Mars in Gemini. Please enlarge image since not all chart factors penned on may appear in the following text. Neptune rising (with Achernar, a star of crisis) suggests more of such things as scandals, propaganda, lies, 'fake news', paranoia, fanaticism, glamour, and a potential for large water-related events (or gas, oil, and/or fumes or toxins) and/or other difficult weather disasters--any of which may be too vast to handle and cause loss. 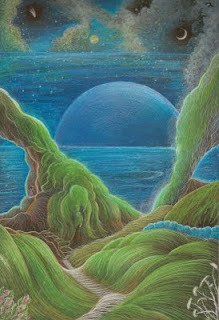 Of course, karmic Saturn can bring loss as well and Saturn at MC (in Sagittarius, sign of immigrants, refugees, other foreign concerns, plus, travel) hints at a year when accountability, limitations, and taking responsibility in career-related matters are demanded--and the public (MC) must see this as reality (Saturn)--enough of the veils and cover-ups that astrological Neptune loves to supply. And of course, Saturn relates to the law and lawmakers so we may be seeing a cosmic picture here of the Trump administration's ongoing Russia problems, inflated as they may or may not be. 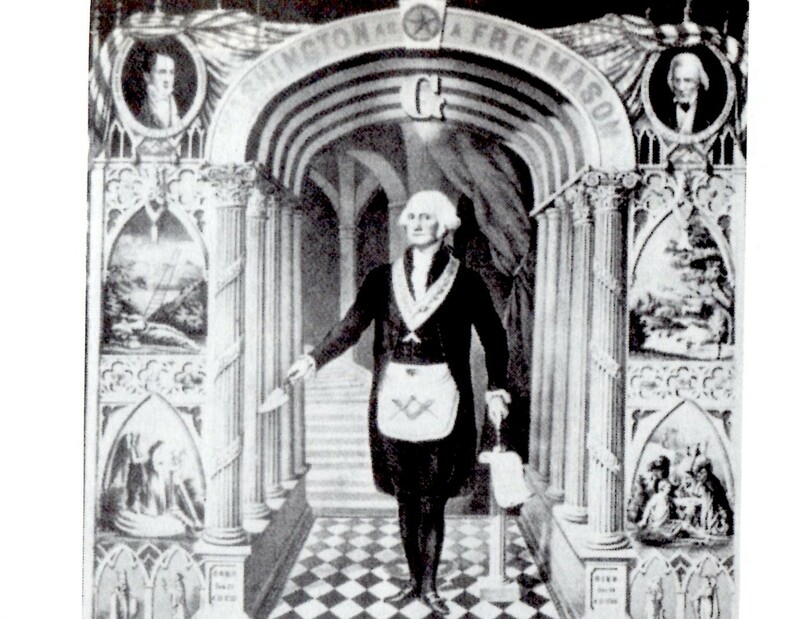 So naturally, invisible/secret (Neptune) government (Saturn) peeks from behind the curtain of power whether identified as 'Deep State' (more of a Pluto-Saturn signature), CFR/Illuminati, international bankers, or otherwise. Plus, we find transit Pluto Rx @18Capricorn in 11th house of Alliances sitting atop the NWO degree of the Great Uranus-Neptune conjunction/s of 1993: "A British Destroyer"...POLITICAL POWER = smug or strong-armed paternalism (Jones). I'll have to symbolically paint Mr. Trump with that particular daddy brush although others of the wealthy neoliberal class suit the paternalism picture just as well. Well, perhaps Republican austerity measures (and weakened health care provisions in their Trumpcare bill) require veiling Neptune rising in order to get the corporate monster passed in the Senate. See Sun-Pluto = US Saturn, below. Now if you look upper right on the chart, you'll see the dynamic Cardinal T-Square listed between Sun-Pluto (craving power; plutocracy) pointing toward apex Jupiter @14Lib10 (7th house and conjunct US natal Saturn, a transit we've previously discussed as partial burdens lifted). This energetic Cardinal pattern spotlights someone (Jupiter) with a deep urge to acquire wealth and though this may describe most politicians as a class, it seems to relate closely to Donald Trump who is in the midst of his latest Jupiter Return, with the third of three conjunctions perfecting on August 4, 2017 (17Lib27). 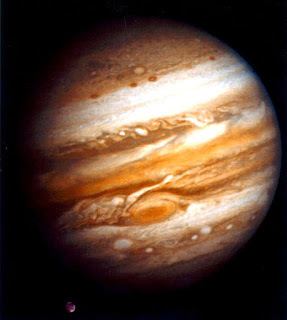 As you know, astrological Jupiter is a corporate planet ('CEO') of expansion and abundant resources, of course, and he freely crosses any boundary he meets, chafes against limitations, and tends to grab whatever attracts him. In Venus-ruled Libra, Mr. Trump's Jupiter accounts for his many cries of "that's not fair!" which is a huge part of how he relates to other people (shown by one's Jupiter sign). Fairness is his aim though the over-sensitivity of his rising Mars in proud Leo often interferes with an impatient 'me first' attitude and the quarreling nature of a street fighter. Here, the Sun rules the 6th house of service which includes Civil Servants, Police and Military Forces and with the North Node posited there, we may expect future actiona related to those branches of government. For solar outcomes--however ego-driven they may be--we look to aspects to the Return Sun which include the square from Jupiter (0A50), a trine from mysterious Neptune (also 0A50! ), the opposition by Pluto (4A55), and an applying conjunction by the Sun to warrior Mars at critical degree (20Cancer). Simultaneously, speedy Mercury @28Cancer opposes US natal Pluto (Rx @27Cap) which denotes that info or intell is purposefully withheld or distorted and opposing forces challenge opinions. A Sun-Pluto opposition across the 5/11 self-will axis suggests extreme defensiveness when challenged, a quality naturally possessed by Mr. Trump, and hints at issues of an insecure ego. As POTUS (US Sun in Cancer), we find a man in a role quite large for him which has increased his tendency toward defiance. However, if logic is used and good advice taken, he may yet come out ahead of his many critics, or at least, may remain in office. Yes, there are massive forces set against him for during his 2016 presidential campaign, he promised to vanquish such forces long in control of the US government. Can he be surprised at how desperately they fight against him? So why did 'they' allow him to enter the Oval Office at all? To me it seems part of a long-range strategy to weaken America and the office of the presidency, and to undermine our accustomed global leadership, something that is occurring as I type! Whether Mr. Trump is conscious of being used as such a tool for other people's interests is anyone's guess at this early date but there is powerful Pluto @18Cap and demanding that The Big Picture be followed, or else. And with secretive, confused Pisces rising, Jupiter and Neptune rule and co-rule the chart and our national Solar Return--but they are inconjunct one another! This describes a Jupiterian who misunderstands his responsibilities and struggles with problems of his own making--sound familiar, tweeters? It isn't that he doesn't want to fulfill his role, it's that the work is harder than he had imagined it would be and there is some measure of guilt attached to societal concerns such as aid for the needy. One thing to watch is how Neptune rising with potential weather or other natural disasters play out in the context of adequate FEMA funding. Hopefully, the two Grand Trines (Saturn-Uranus-NN and Moon-Mercury-Chiron) will provide protection for the innocent! 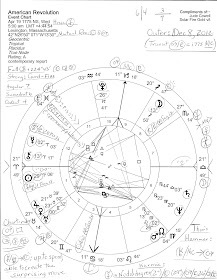 So with the next year's solar conditions for and in America and the office of the president spotlighted in the 5th house of Risk-Taking, we find Jupiter in Libra as apex (focal point) of a Cardinal T-Square...what of it? Apex Jupiter in this configuration is primarily concerned with personal enrichment yet feels an urge to broadcast his views to the masses. How things could be is a typical topic as he looks toward an elusive future while grasping benefits for himself in the here-and-now. Since the Cardinal mode is initiating, pioneering is part of the picture, especially with adventurous Jupiter involved who, in spite of personal shortcomings which include superficiality, loudly promotes his causes to great effect. As we all do, this Jupiterian needs to practice what he preaches yet political concerns (and advisers) may often interfere since muddled ethics and changing standards offer him little direction or constancy. Rashness and a tendency to over-extend may be evident via this opinionated apex Jupiter and dogmatism may be part of his promotional efforts (Tierney). Bigotry and prejudice may continue to peek through his actions and rhetoric which suits some of his audience while deeply offending others. Yes, the Jupiterian Mr. Trump's optimism toward America is apparent, even uplifting, yet an inability to consider long-range consequences created by the short-term benefits he desires (emoluments? conflicts of interest? loved by all?) can trip him up in the long run as Saturn at MC demands accountability, authenticity, maturity, realism, and truth from America's chief executive. So what if we replace the Cardinal T-Square's apex Jupiter with US natal Saturn? Then we have a description of a society that allows or permits social injustices to continue, imprisons millions of its population, and supports domineering Saturnian actors who purport to 'bring order to chaos' but have unclear goals and a hidden agenda. It is, in Hegelian form, a chaos they themselves have intentionally created. A Related Horoscope: Donald Trump's Mars Return August 31, 2017.